I hope you are all enjoying warm, sweet freedom ;) Due to a few requests in a recent post, I have decided to talk about my summer bucket list. I have been compiling this list in the last couple weeks and am so fired up to do everything! 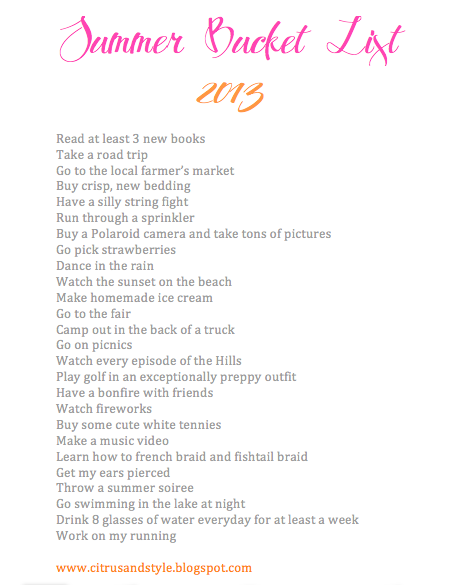 Without further adieu, here is my 2013 Bucket List! As cliche as this sounds, I am so excited to have the best summer ever. Ooh yeah that's such a great idea! aww this sounds like so much fun!! i'm hoping to have an amazing summer as well, and i just might have to make a bucket list as well so that i can make sure to do everything that i want to do! Working on my running is definitely on my list this summer! I totally need practice! Haha! P.S., I nominated you for the Liebster Award on my blog! I would love to see your answers! I love this and I definitely want to make my own!